The Backyard Treatment Bundle is a combination mosquito treatment promotion designed to help pest professionals develop a comprehensive program with products from the Zoëcon lineup of insect control solutions. 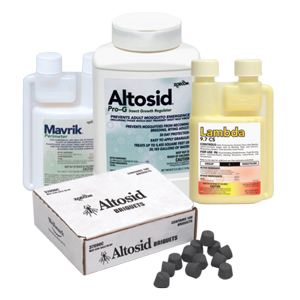 From May 1 through Sept. 30, 2016, receive a distributor-reported rebate at the time of purchase of $50 per case of Altosid Pro-G larvicide granules with the purchase of a case of Lambda 9.7 CS (quarts or pints) or a case of Mavrik Perimeter. Lambda 9.7 CS and Mavrik Perimeter each provide rapid knockdown and relief from biting adult mosquitoes, while Altosid Pro-G targets the next generation of mosquito larvae.